Constand Viljoen was born on 28 October 1933 in Standerton, Mpumalanga Province. He matriculated in Standerton High School in 1951. He joined the South African Defence Force and obtained the degree B.Sc (B. Mil) at the University of Pretoria in 1955. In 1977 General Viljoen became the Chief of the South African Army and in 1980 the Chief of the South African Defence Force. Under his command South African troops became directly, and controversially, involved in the civil war in Angola. In 1985 General Viljoen retired and went on pension to farm full-time on his farm in the Ohrighstad district in Mpumalanga. He came out of retirement in the early nineties and. together with three other Generals, General Viljoen helped to establish the Afrikaner Volksfront (AVF) in 1993. 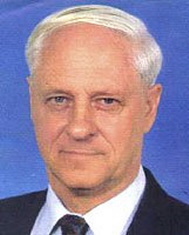 Political developments in South Africa lead to the establishment of the Freedom Front Party by General Viljoen, and the participation of the party in the April 1994 elections. During these elections the Freedom Front obtained 640,000 votes which gave the party nine representatives in the national parliament together with five senators in the Senate. General Viljoen retired from active politics and as leader of the Freedom Front in 2001. At present he is a full-time farmer and is also a director on the Board of Armscor. He is married and has five children. Gastrow, S. 1995. Who's Who in South African Politics, Number 5. Ravan Press: Johannesburg. Joyce, Peter. A Concise Dictionary of South African Biography (1999). Francolin : Cape Town.